The PTF will be hosting a special Faculty and Staff Appreciation Luncheon (FSAL) on Monday, May 6 for St. Andrew’s Schools’ K-12 teachers, administrators, and staff – all of whom do so much for our daughters and sons each day. It’s our way of showing how much we appreciate their commitment and dedication, caring and guidance, and motivation and inspiration. Every year, our parents contribute to make this a very special event. If you would like to donate a dessert, salad or small gifts for door prizes, or help with centerpieces, decorations or set up, please visit this link to sign up. For parents who would like to make a monetary or gift card donation, a sign-up link will be coming soon. Ms. Cheri in the Lower School office is accepting the donations for us. If you have any questions, we’d be happy to answer them. You can contact Kathrine Fast at kathrine@hawaii.edu for any general questions, or Jane Taafaki at taafakisam@gmail.com for questions related to dessert or salad donations. The PTF conducted its annual Campus Beautification Day on Saturday, March 9. Approximately 50 volunteers made up of parents, students and school staff conducted several improvements including mowing the Queen Emma Square lawn, trimming hedges, weeding planting beds and The Prep play area, cleaning Ylang Ylang Courtyard umbrellas; and cleaning The Cathedral of St. Andrew, the gymnasium, Ylang Ylang courtyard and the Lower School play structure. The PTF extends a heartfelt mahalo to all its volunteers for giving up a part of their weekend to help beautify the campus. 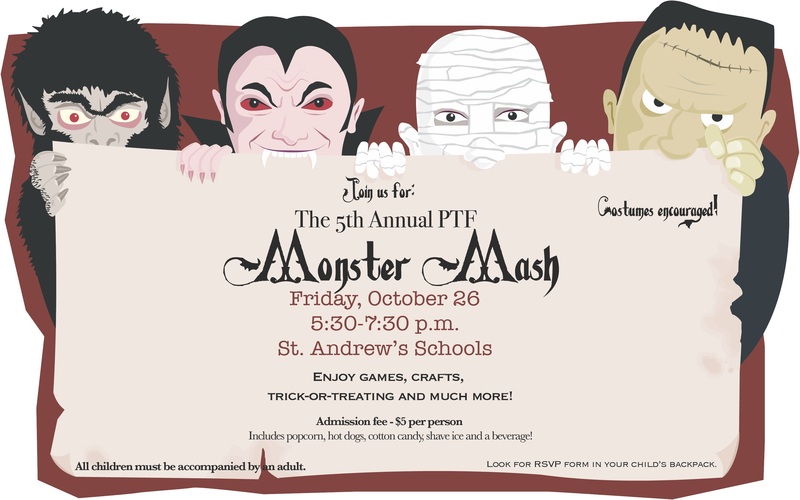 PTF also thanks St. Andrew’s School’s facility and maintenance staff, as well as the CBD committee for their time and efforts in organizing, supporting and executing a safe and successful event. The committee sincerely hopes everyone enjoys the improvements. The Queen Emma Ball will be held on campus on April 4. The ball is St. Andrew's Schools' annual signature event that raises funds to support student scholarships and faculty professional development. Our Advancement Office has been working hard to prepare for the event and is asking for parent help with some pre-event preparation and set-up for the event. Please consider taking some time to help out if you can. If you have questions about the ball, or are willing to be called for other tasks that may come up (e.g. making phone calls, picking up donations, stuffing envelopes, etc. ), please contact Nicole Kuamoo at nkuamoo@standrewsschools.org. 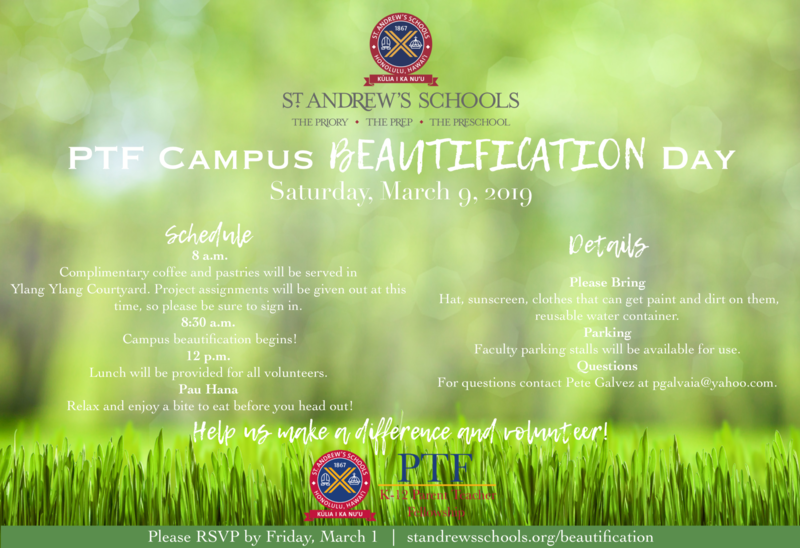 The PTF and school administration are sponsoring our annual Campus Beautification Day next week Saturday, March 9 from 8 a.m. to noon. It's a great opportunity to participate in community fellowship and service. Projects usually include general cleanup, gardening and sometimes painting. While childcare is not provided, you are welcome to bring your children to help under your supervision. Refreshments and lunch will be provided courtesy of the school administration. We need volunteers for two upcoming events. If you are able to help out, please consider donating your time. It's also a great way to meet other parents and stay in the loop about all the wonderful happenings at St. Andrew's Schools. We're currently seeking volunteers for our upcoming Campus Beautification Day on March 9. Please see information below and contact Pete Galvez if you are able to attend. We hope to see you there! Please consider volunteering at this year's Queen Emma Ball event, which is our school's largest fundraiser. Happy Valentine's Day, parents! We sure felt the love last weekend as our daughters danced the night away with their fathers at the annual Father-Daughter Ball. You can read the story here and check out the pictures from the special event. Please consider volunteering at this year's Queen Emma Ball event, which is our schools' largest fundraiser. The Father Daughter Ball is this Saturday and we know that our daughters and fathers are getting excited. We can't wait to see you there as we make special family memories. We're excited to see everyone at the Father-Daughter Ball next weekend! The Father-Daughter Ball on February 9 is quickly approaching! Please be sure to RSVP by this Friday, January 25. Campus Beautification on March 9 is our next event. Please look for a backpack flyer going home soon for more information. We will also be seeking volunteers for this event. Volunteering is a great way to get involved with your school community and meet other parents! The Father-Daughter Ball on February 9 is quickly approaching! Please be sure to RSVP by next Friday, January 25. Campus Beautification on March 9 is our next event. Please look for a backpack flyer going home soon for more information. We will also be seeking volunteers for this event. Volunteering is a great way to get involved with your school community and meet other parents! As we begin the New Year, the PTF would like to remind everyone that the Father Daughter Ball (Feb. 9), Campus Beautification (March 9) and the Teacher Appreciation Luncheon (May 6) are all coming up! Look for more information coming soon about these events, including volunteer opportunities. These are all great opportunities to get involved with your school community and meet other parents! The Father Daughter Ball (Feb. 9), Campus Beautification (March 9) and the Teacher Appreciation Luncheon (May 6) are the events slated for 2019! We had so much fun at the Great Holiday Pick-Up last weekend. A big mahalo to everyone who volunteered to make it such an enjoyable and smooth experience. We couldn't have done it without your support. Thanks to all who placed orders! Please remember pick-up day is Saturday, December 1, 8:00 a.m. to 12:00 pm at the St. Andrew's Schools drop-off area. Please consider helping out with packing and/or distributing GHPU orders. It won't take much time and it's a great way to get to know some parents. You can sign up here. A heartfelt thank you to all the parents who contributed to the success of our recent events – the Monster Mash and the making of our Jams and Jellies! The Grade 9 girls did a great job of providing games and treats for the Monster Mash. You can check out some of the pictures from the event here. Thanks to all who placed orders! Please remember pick-up day is Saturday, December 1, 8 a.m. to 12:00 pm at the St. Andrew's School drop-off area. October was a very successful month for Jams and Jellies production! Three weekends of chopping, boiling, and cooking yielded almost 400 jars of Hot Pepper Jelly, Lemon Curd, and Apple Cranberry Jam. These goodies are now on sale through the Great Holiday Pickup, so buy while supplies last! MAHALO! It goes without saying that it takes time and effort from many to accomplish this task. I’d like to express appreciation to all the parents, alum, and alumnae parents who contributed donations and time. Thanks to Shin Kim, Lyn Utsugi, Faye Yamasaki, Iris Reilly and her mom, Kana Itoh, Karen Frato-Hildebrant, Jennifer Burke, Amy Geppert, Robyn Mukae, Matt Chang, Kana Itoh, Haaheo Thoren, Jennifer Shintani, Joni Stewart, Elsie Au, Zoe-Ann Kauka, Lesley Yost and Kathrine Fast for donating time on their weekends to cook up our jams and jellies. A special thanks to Brad Koyangi and Craig Terada for allowing the generous use of kitchen facilities, Evon Kawamoto for donating lemon juice, Connie Conover for her monetary donation, Steve Onoue of the Lion’s Club for the sugar donation, Margaret Katagihara for arranging keys and access and Dani Douglass and Elizabeth McDonnell for their help with communications. None of this would have been possible without the substantial time and help of Laurie Ahlgren and Patty Oishi, past Priory parents, and Jane Taafaki, current PTF co-president, who coordinated this year's efforts. Mahalo to all that helped with our Jams & Jellies production! Make sure to place your order for some of the tasty treats through the Great Holiday Pick-Up. The online ordering due date has been extended to October 28! You can order online or print and fill out the order form. Orders can be left in the PTF mailbox in the Upper School Office. The pick-up date for trees and wreaths is December 1. Be sure to share with your family and friends! See you tomorrow at 5:30 p.m.! It's going to be a ton of fun. This is a great way to pick up holiday gifts for friends, family, or co-workers. The GHPU online form is now live and you can access it here. Orders need to be placed by November 7. Pickup is December 1. Remember all those Jams and Jellies...just some of the many items available for purchase! Please don't hesitate to contact Kathrine or Jane at ptf@standrewsschools.org if you have any questions or want to talk about any of the upcoming activities. The PTF has been busy this semester with several events coming up! We've heard back from some parents that it's been challenging to find information and volunteer sign-ups. The feedback is appreciated and we're working on the best way to communicate with parents about events, volunteer requests and fundraising. In the meantime, please look over this message to see what's happening this semester with the PTF and what you might like to become involved in. This coming weekend is the last weekend for making Jams and Jellies. So far we've made Hot Pepper Jelly and Lemon Curd. This weekend we'll be making Cranberry Apple jam. There are spots available to help on Saturday if you are interested; please sign up here. There's still time to order Christmas trees and wreaths! You can order online or print and fill out the order form. There's still time to RSVP for Monster Mash! Just print out this form and return money and form to your child's homeroom teacher. Volunteers are still needed for this event. Please consider helping out with this fun event and/or donating baked goods. We're especially looking for Upper School parents or parents who are not participating in the event so that parents with children at the event can enjoy. Our St. Andrew's Schools annual Jams and Jellies 2018 is coming up! Each year, St. Andrew's parents help to contribute to the Great Holiday Pick-Up by volunteering in the production of our famous Jams and Jellies. This year, the Parent Teacher Fellowship is again organizing the Great Holiday Pick-Up with profits going toward a capital improvement project at our school and PTF sponsored events. Volunteering for Jams and Jellies is a fun way to meet other parents and learn a new skill or two! Join us for the sessions on Friday nights and/or weekends in October. This year's event is led by St. Andrew's parent Jane Taafaki-Sam, in conjunction with past parents and Jams and Jellies experts Laurie Ahlgren and Patty Oishi. Please sign up for as many days as your schedule allows! Everyone's availability differs, so let us know if you will come or leave at different times than the requested volunteer sessions via the comment window. Any time you can give is appreciated. Please contact Jane (808-388-0736 or taafakisam@gmail.com) to arrange drop off of supplies/donations. Some additional details: Please bring an apron and tie your hair back/cover your hair. We will be using the school's commercial gas stove, so wear cool, comfortable clothes and covered shoes. Avoid loose blouses, billowing sleeves and front ties. Since we get into a busy rhythm, we don't have a planned lunch, so please bring your own lunch and snacks (refrigerator available). Iced water will be provided. Prior experience is a plus, but not necessary! All utensils and pots will be provided. All workshops will be in the St. Andrew's Schools' kitchen located in Ylang Ylang Courtyard. Since childcare is not possible and safety is a priority, please make other arrangements for your children during our time together in the kitchen. Habilitat Trees Now on Sale! Order your tree by October 19. You can order using this form or online. Please join us to make this year's Monster Mash a fun event for the entire family. We are looking for registration and kitchen help (prepping snacks and serving food), as well as set up and cleanup. You can also sign up if would like to donate baked goods for our PTF bake sale. Just bring your goodies and drop them off at the bake sale or registration table at the start of the event. If you would like to drop off at another time, just leave a note in the sign up and we'll contact you. We ask that baked goods be individually wrapped, and anything with nuts be prominently labeled. Sign-up here! Ms. Zane will also collect and hold baked good for the bake sale. You may drop off goodies to her classroom (J-101) on Thursday and Friday, October 25 and 26. Some additional details: Please bring an apron and tie your hair back/cover your hair. We will be using the school's commercial gas stove, so wear cool, comfortable clothes and covered shoes. Avoid loose blouses, billowing sleeves and front ties. Since we get into a busy rhythm, we don't have a planned lunch, so please bring your own lunch and snacks (refrigerator available). Iced water will be provided. Prior experience is a plus, but not necessary! All utensils and pots will be provided. All workshops will be in the St. Andrew's Schools' kitchen located in Ylang Ylang.